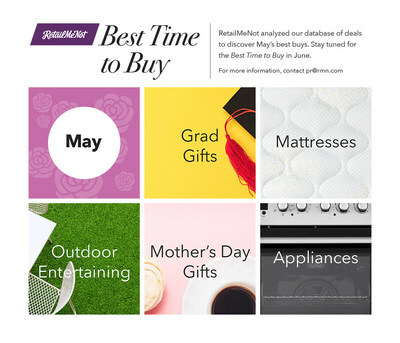 AUSTIN, Texas, May 2, 2018 /PRNewswire/ -- May is an excellent month for shoppers to score deals on gifts for graduation, gifts for mom and even gifts for themselves to kick off the summer season. RetailMeNot data shows there are ways to save on essentials for all of the above, and even more. Shopping and trends expert, Sara Skirboll, has advice on how: "To get the best deals, shop early in May for discounted Mother's Day presents, graduation gifts and outdoor entertaining items. And when you need some rest, take heed: Mattresses are on sale this month!" The outdoor entertaining season has finally arrived, and as the grills start to sizzle, so do the deals! If shoppers are in the market for a new barbecue pit, consider buying in late May, closer to Memorial Day, when retailers prep for the holiday weekend with heavy discounts. Graduation parties are another excuse to have a backyard bash for friends and family. For those looking to upgrade their summertime soirée, look to retailers like Home Depot, JC Penney and Sears for savings on all types of patio furniture and decor. Conventional wisdom says to buy appliances in September and October. And while that holds true for washers, dryers and stoves, it's not the case for refrigerators. New models are released in May, making this a great time to take advantage of the discounts that retailers will place on older models. May is also the time to purchase small appliances like cookware and any last-minute spring-cleaning items like upright, handheld and roaming vacuums. Stock up on loads of home essentials at retailers such as Sears, JCPenney and Bed Bath and Beyond.